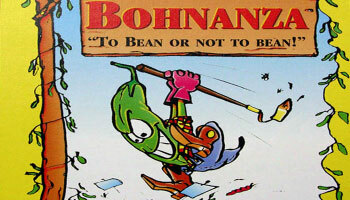 Bohnanza is the first in the Bohnanza family of games and has been published in several different editions. The cards are colorful depictions of beans in various descriptive poses, and the object is to make coins by planting fields (sets) of these beans and then harvesting them. To help players match their cards up, the game features extensive trading and deal making. One of the most unique features of the game is that you cannot rearrange your hand, as you need to play the cards in the order that you draw them. The original German edition supports 3-5 players. The English version from Rio Grande Games comes with the first edition of the first German expansion included in a slightly oversized box. One difference in the contents, however, is that bean #22's Weinbrandbohne (Brandy Bean) was replaced by the Wachsbohne, or Wax Bean. This edition includes rules for up to seven players, like the Erweiterungs-Set, but also adapts the two-player rules of Al Cabohne in order to allow two people to play Bohnanza. 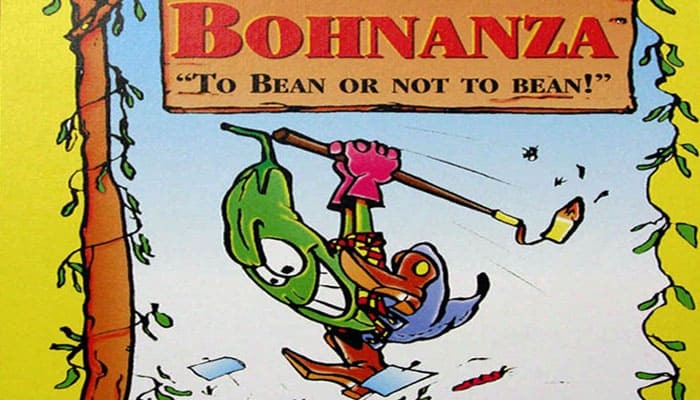 Bohnanza is all about planting, trading, and harvesting beans. Trade beans with the other players and plant them in your fields. That is great fun! And the more beans you have in your field, the more gold coins you get when you harvest them. If you have the most gold coins at the end of the game, you win! The following rules describe the original Base-Game for 3-5 players, with the original bean kinds. Add the Cocoa, Wax, and Coffee Beans to your game. Depending on the number of players, you will need to remove certain types of beans from the game. The number of available bean fields also depends on the number of players. Remove the Garden Beans and the Cocoa Beans from the game. A player may only sell beans from his bean fields on his turn. The game ends when the draw deck is exhausted for the first time.